Geographical distribution Odisha, West Bengal, Chattisgarh, Tamil Nadu, Chota Nagpur, Vishakaptnam, Madhya Pradesh, Bihar. India is on an upswing when speaking about the Steel Industry because of the strong global and domestic demand. The rapid economic growth and progressing demand by sectors like infrastructure, real estate and automobiles, at home and abroad, has put Indian steel industry on the Global Map. The latest report conveys that in International Iron and Steel Institute (IISI), India is the seventh largest steel producer in the world. The modern Indian steel industry's origin was from way back in 1953 when a contract for the construction of an integrated steelworks in Rourkela, Odisha was signed between the Indian government and the German companies Fried Krupp und Damage AG. The annual capacity of 500,000 tonnes was the initial plan, and then later subsequently rose to 1 million tonnes. Presently the capacity of Rourkela Steel Plant (RSP), which belongs to the SAIL (Steel Authority of India Ltd.) group, is about 2 million tonnes. The former USSR and a British consortium at a very early stage also showed an interest in establishing a modern steel industry in India. All these initiatives resulted in the Soviet-aided building of a steel mill with a capacity of 1 million tonnes in Bhilai and the British-backed construction in Durgapur of a foundry which also has a million tonne capacity. Indian steel industry organized it self as three categories such as main producers, major producers and secondary producers. The main producers & major producers have integrated steel making facility with plant capacities over 0.5 MT which utilize iron ore and coal/gas for production of steel. The major producers are Tata Steel, SAIL, and RINL, while the other producers are ESSAR, ISPAT and JVSL. The secondary sector is dispersed and consists of firstly the 12 sponge iron producers of Backward linkage that use iron ore and non-coking coal, providing feedstock for steel producers; and then the next is approximately 650 mini blast furnaces, electric arc furnaces, induction furnaces and energy optimizing furnaces that use iron ore, sponge iron and melting scrap to produce steel and lastly forward linkage with about 1,200 re-rollers that roll out semis into finished steel products for consumer use. India Steel Industry has tremendously grown in records for production. In 1992, India was able to produce 14.33 million tonnes of finished carbon steels and 1.59 million tonnes of pig iron. The steel production capacity of the country increased rapidly since 1991 and in 2008, India produced nearly 46.575 million tonnes of finished steels and 4.393 million tonnes of pig iron. In 1992, the total consumption of finished steel was 14.84 million tonnes. In 2008, the total number of domestic steel consumption was 43.925 million tonnes. With the growing demand in the national market, a huge part of the international market is also served by the Indian Steel industry. In 2005- April-December the production of the finished steel recorded a growth of 4 % and reached 28.3 million tonnes. 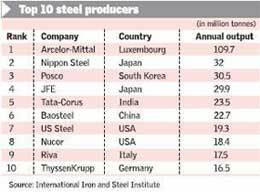 Indian steel industry ranks 10th in the world's scenario. The industry today represents approximately Rs. 9,000 crore of capital and provides direct employs more than 0.5 million people. In India about 50% of the steel produced is exported. The industry export of steel during April - December 2008 was 64.4 MT as against 9.7 MT in December 2007. The export of steel in February 2009, increased by 17% to 12.6 MT from 10.8 MT in the same month the previous year. India exports more than 50% of steel to China. The major boost came to the export of steel when Government took the decision to reduce export duty on iron ore lumps from 15% to 5%. The category for Indian Steel Industry is "Red" which represents highly polluting industries; the classification helps common people to understand about pollution as well as prioritization of plans and programmes of pollution control. Domestic consumption of steel in India has grown by 12.5% better than later years. All over India the construction projects are major consumers of steel. The largest steelmaker in the world Arcelor Mittal has plans of establishing two Greenfield steel projects with capacity of 12 million tonnes annually, in India. Acerinox SA is setting up a steel plant in India, one of the important stainless steel manufacturers in collaboration with Nisshin Steel, Japan. 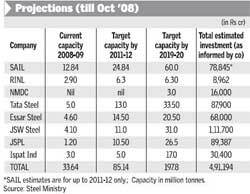 The Tata Steel has plans of expanding its capacity by the year 2015 & ranks 5th in the world steel production. 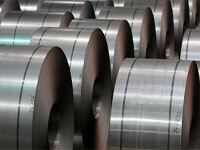 India's biggest producer of steel SAIL has plans of increasing the production to 24.98 million tonnes annually. China's Sinosteel Corp is planning to invest US$ 4 billion to set up a 5 million tonnes capacity Greenfield steel plant. Tata Steel has acquired Anglo-Dutch steel manufacturer, Corus. The 1.63 billion US$ acquisition of Canada for The Algoma Steel by Essar Global. Though had progressed in its steelmaking considerably, however, nearly 6% of India's crude steel is produced using the outdated open-hearth process. India still has low labour productivity. The output at the biggest Indian steel maker according to an estimate crude steel output is roughly 144 tonnes per worker per year, whereas in Western Europe the figure is around 600 tonnes. 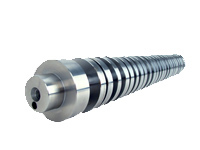 India has to gear up in the production of stainless steel, which is primarily required by the plant and equipment, pharmaceutical and chemical industries. Because of power shortages the Steel production in India is also hampered. In raw materials requirement India is deficient. India's hard coal deposits are of low quality. In 2009 according to The Press Information Bureau, the government took a number of fiscal and administrative steps to contain steel prices. Central value added tax (CENVAT) on steel items was reduced from 14 per cent to 10 per cent with effect from February 2009. India's per capita consumption of steel is only 27kg per capita, which is far below the level of other developed and developing countries - 472.4kg, 428.6kg and 128kg in USA, EU and China respectively. The government for the Union Budget of 2010-11, has also allocated US$ 37.4 billion for infrastructure sector and has increased the allocation for road transport by 13% to US$ 4.3 billion which would promote the steel industry. The Indian steel industry has had humble beginnings. The acquisition of the British steel giant Corus steel by Tata Steel and the acquisition of Arcelor by Mittal Steel herald a new beginning for the Indian steel industry. All these are the evidences that the Indian steel industry has acquired a global identity and is today extremely competitive globally. Today some of the prominent steel producers are Tata Steel, Posco, Essar, Ispat, Sail and Rinl. Indian steel industry contributes about 2% of gross domestic product, or about USD 20 billion to the country's USD 1 trillion economy. India is known as the 5th largest producer of steel in the world, behind China, Japan, Russia and the United States. It produced 55.1 million tonnes of the alloy in 2009, but is still only a tenth the size of China, the No.1 steel producing country. The largest producer of steel in India is State-run Steel Authority of India, with capacity of 13.8 million tonnes. Tata Steel, the world's No. 8 steelmaker, has capacity in India of 7 million tonnes, while JSW Steel is third with annual capacity of about 6.9 million tonnes. A report of research in India reveals that steel consumption in India is expected to grow significantly in coming years as per capita finished steel consumption is far less from its regional counterparts. During the year 2008, per capita finished steel consumption was estimated to have a volume of around 44 Kg, which represents tremendous growth potential for coming years. "Indian Steel Industry Outlook to 2012" is an outcome of an extensive research and conceptual analysis of the steel industry in India. The detailed information is provided by the forces which have led to the industry towards remarkable developments in the past few years. The report emphasizes an insight into the future outlook of various vertical industry segments, including automotive, aerospace, marine, consumer durables, power, railways, telecom and housing. This report has classified the finished steel product market into two categories - alloy and non-alloy. It covers the information on overall steel consumption industry-wise steel demand, production and trading market.